St Wilfrid’s is a classic Celtic church design similar to Monkwearmouth, with a high roof and no side aisles. The interior was re-ordered in 2008 and is one of the most beautiful Catholic churches in the north east. The altar and reredos are carved in soft Belgian stone, with the walls decorated by hand with the names of local and universal saints. The extensive stained glass windows are a particular feature. The church owes its origins to the Benedictine mission in the area and, in particular, to the Sidney family of Cowpen Hall. In the 1850’s, as the Catholic population in the area began to expand, Fr. Burchall, the parish priest of Cowpen and Mrs Sidney of Cowpen Hall, instigated plans for a new church in Blyth. 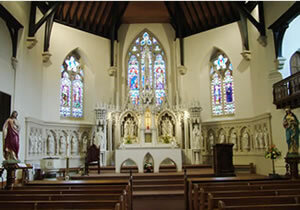 A Newcastle based architect A.M.Dunn was engaged to design the church which was dedicated to Our Lady and St. Wilfrid. The work began in 1859 and was completed in 1862. The first parish priest was a Benedictine Fr.Dromgodle, who served the parish for 44 years after his appointment in October 1862. The Benedictine mission in St. Wilfrid’s ended in 1970 when the first diocesan priest Fr. Thomas Power was appointed. The United Reformed Church are resident in the building using the day chapel on Sundays and offering a scripture group on Tuesdays and a coffee morning on Fridays in the adjoining community room.